11/30/2016–MOCKSVILLE, NC–Things were flying high at Sugar Valley Composite Squadron’s drone training day on 19 November. After an introduction and refresher on drone safety and controls, 3 cadets new to the squadron joined cadets and senior members in the Blue Hangar at Sugar Valley Airport. 1st Lt Thornburg, the squadron’s Aerospace Education officer, started the new cadets off with a one-minute hover challenge using a small Hawkeye 1 drone. As the first-timers soon learned, it is not as easy as it looks! After everyone acquired some skill with hovering, it was time to try more advanced techniques. 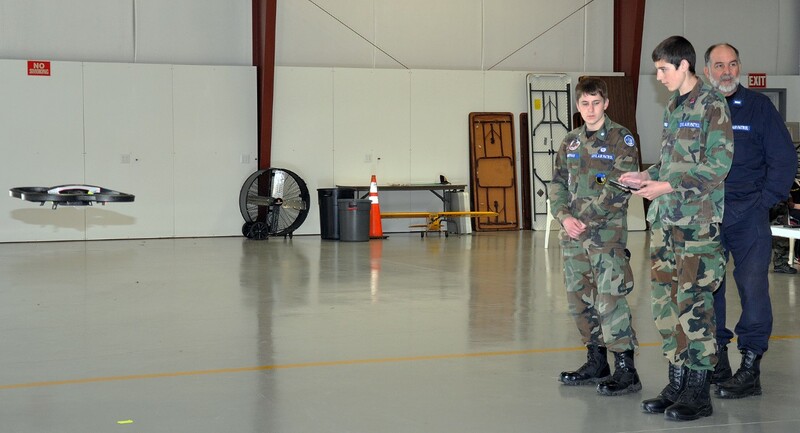 1st Lt Thornburg tasked the cadets with taking off and landing on separate markers with the Syma X11C drone. The cadets started getting the feel of it after a few tries. Afterwards, the cadets practiced with the 2.0 AR Parrot, the squadron’s largest drone. Cadets that showed more proficiency with flying drones also flew the Syma X5 Explorer and the Landvo JJRC. Since drone flying is fun for all, senior members practiced their skills as well. The Sugar Valley Composite Squadron is pursuing the education of senior members and cadets in drone flying with the idea that drones can be extremely helpful and innovative in Search and Rescue and Disaster Relief missions through Civil Air Patrol. The Sugar Valley Composite Squadron meets weekly at Sugar Valley Airport, 249 Gilbert Rd, Mocksville, NC, on Tuesday from 6:30 PM to 8:30 PM.